I doubled everything I made for my friend since most of the effort in Chinese cooking is the chopping – that way I could feed my household as well as her. I am all about the greens lately. Just craving them like crazy because I want wholesome, simple food. And that means my mom’s cooking. It’s nothing fancy, but it’s incredibly good. 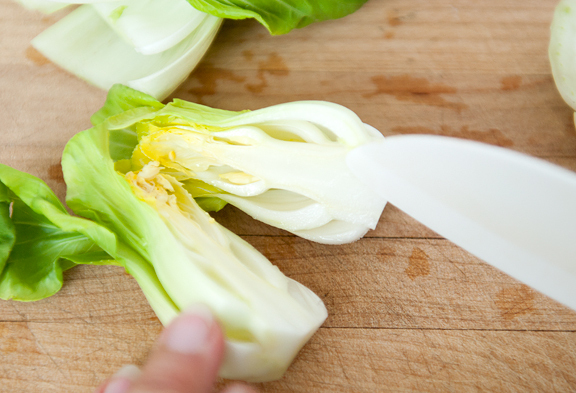 Baby bok choy is usually pretty clean, but give it a good rinse in water to get rid of any silt on the leaves or between the ribs. 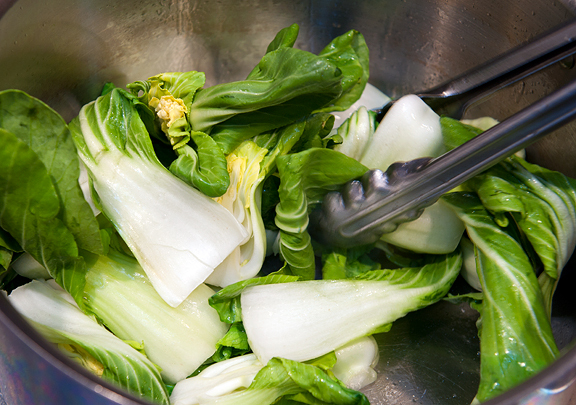 I shake off as much excess water from the bok choy as I can before stir-frying. Since I doubled this recipe, you might think I cooked the whole thing in one go. Nope. I’ve discovered (through trial and much error) that my sauté pan can handle a maximum of a pound of bok choy. If you crowd the pan too much, everything just steams and wilts. So be patient and cook a pound at a time. That’s it – (baby) bok choy, oil, and salt. So simple and yet incredibly satisfying and good for you. It’s a fantastic side dish, but I also love to eat a pile of the greens with a small bowl of rice or with a bowl of hot Chinese noodle soup. That is good stuff. I get baby bok choy in the Asian grocery store although I’ve seen it on rare occasion at regular grocery stores (although they usually look pretty tired). 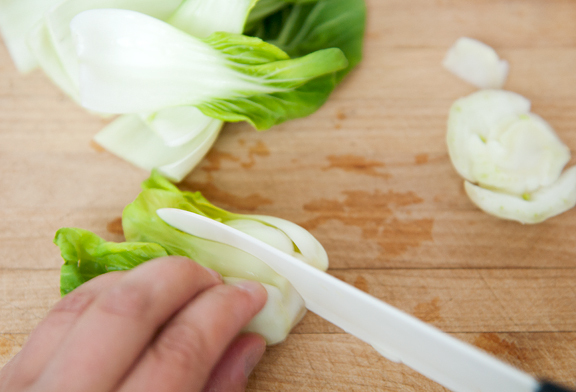 Trim the base of each bok choy bunch and peel away any bad outer leaves. Remove loose leaves from the bunch, but if they’re in good shape – save them. Slice the hearts in half. Wash the good loose leaves and hearts in water and drain. Heat 2 tablespoons of vegetable oil in a large sauté pan. When the oil is hot, add all of the bok choy at once. Stir-fry a few minutes and sprinkle salt to taste (like 1/2 teaspoon, but it varies). 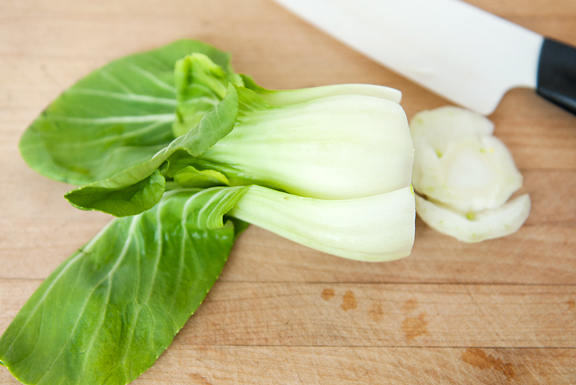 The bok choy is done when the leaves wilt and turn dark green. The white stalks will soften. It took me about 7 minutes. Remove from heat and serve. Serves four as a side dish. This is exactly how I prepare most of my Chinese vegetables. Sometimes I like drizzling a little sesame oil right at the end before serving. Simplicity is always best! I cannot wait, Jen. Seriously, I think about it every.single.day. I am beyond excited! 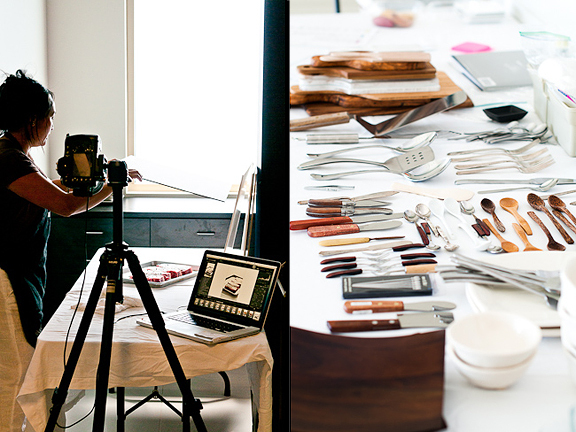 I did a workshop with Matt and Adam in LA about 2 weekends ago and it was amazing. Life changing, kind of! And I cannot wait to meet you and everyone else at F & L! And yes, I love baby bok choy. In my CSA box in San Diego, always get tons of the baby bok. I’ve had similar luck with Boulder/Denver area bok choy: generally very good at the asian grocers, hit or miss with regular grocery stores (they carry it consistently, it’s the quality that’s inconsistent). King Soopers seems to have decent bok choy most consistently out of the regular grocery stores. Wow! I would love to attend – what a great opportunity! OMG. sooooo good, Jen. You’re the best! It is very sweet of you to cook for your friends. 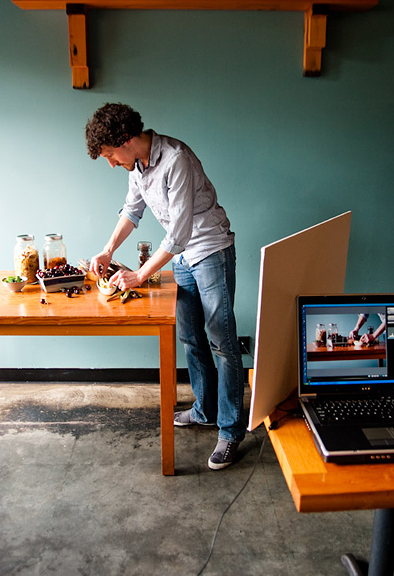 You need good nutrition for the hardworking brain! It is important to keep healthy and sane during the writing up. Staying sane is difficult, keeping healthy is easier, especially with friends like you. Last year we had the most amazing bok choy vendor at the Farmer’s Market. Like all Alaska veggies, it had a slightly sweet taste from being grown in the permafrost. We were eating three heads a week while it was in season. We prepared it simply, just as you described. It was amazing. I later learned that the Farmer’s referred to my boyfriend and I as the “Crazy Bok Choy People”. We have become friends over the last year and have signed up for their CSA. They did ask that we take it easy on the Bok Choy and let others have some. Maybe I’ll sneak some in my suitcase when I come down for Food and Light in August. I am signed up and can’t wait. Is it possible to get a list of those attending? 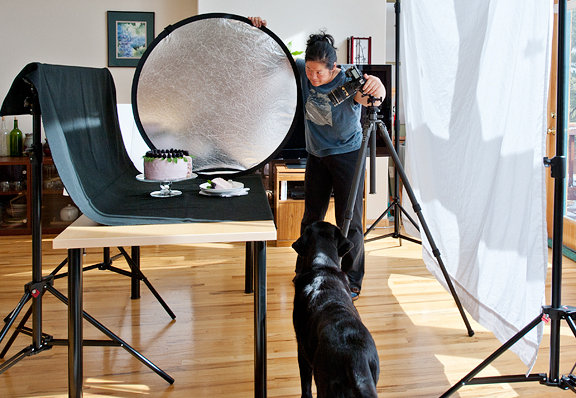 I would love to take a peek at the other bloggers sites. 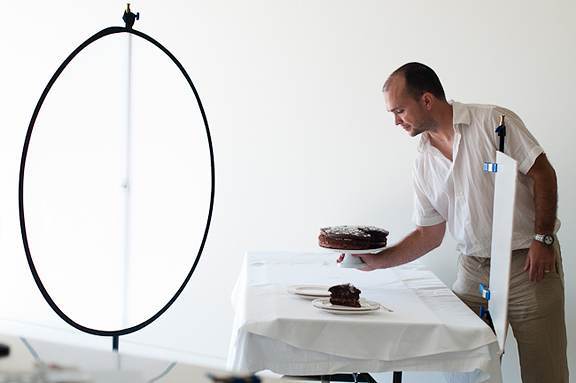 That cake in the first pic? Can’t.stop.eating.it. Delicious would be an understatement! 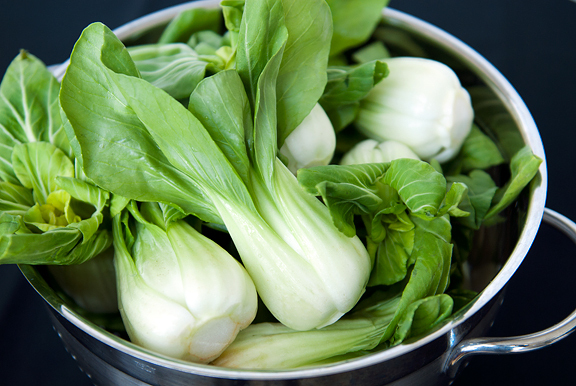 I adore baby bok choy although it is difficult to get where we live in Florida! I would REALLY like to go to your seminar. I’m going to see how to make that happen! I like to stir-fry my veges in a little oil, some garlic and some salt. easy peasy too. 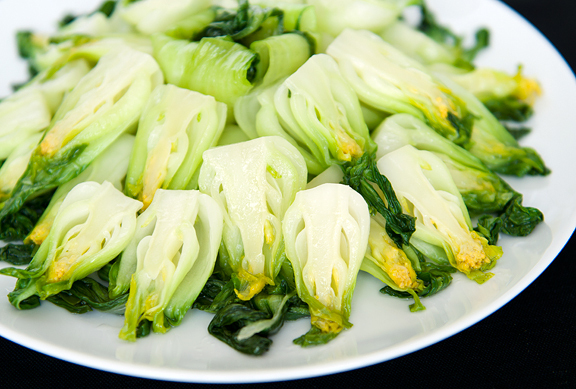 love the way you presented the bok choy! Was going back and forth on whether to attend the F&L workshop, and I finally decided to register! I can’t wait to meet you, Diane, Todd and Matt! Plus, my husband and I are looking forward to exploring Boulder! It amazes me with the amount of effort it takes. I finally got a decent set of lights. I love the recipe. Agnes – good luck, I know how difficult a slog it is. 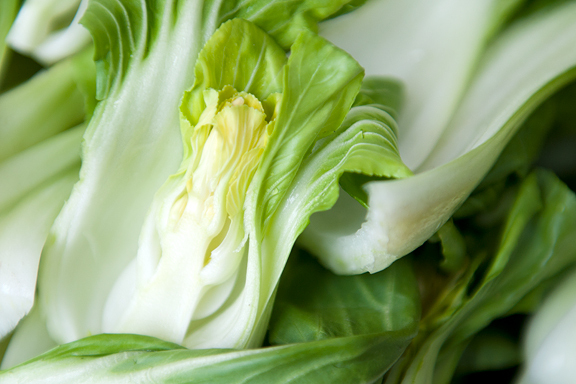 Christine – baby bok choy is my fav!! Lael – We’d LOVE to have you, sweetie!! Mrs Ergul – same here. Also, the hearts are so pretty they kinda make their own plate. Pat – yeah, she keeps us all in line here. 1. Isn’t bok choy getting way too old when it starts yellowing and blooming in the middle?